Just hours after forecasting another quarter of record profits on strong chip sales, Samsung Electronics announced its chip leader would be resigning, which some viewed as a carefully timed move to offset possible market jitters. The unexpected move, however, stoked speculation of a large-scale personnel reshuffle at the tech giant. It also prompted further concern over the management of the conglomerate in the absence of Vice Chairman Lee Jae-yong, who has been jailed over bribery. On Friday, Samsung Electronics said its Chief Executive and Vice Chairman Kwon Oh-hyun would be resigning and would not seek re-election as a member of the board of directors when his term ends in March 2018. He will also resign as the chief executive officer of Samsung Display. “Now the company needs a new leader more than ever and it is time for me to move to the next chapter of my life,” he added. Kwon has been steering the group in Lee’s absence and representing Samsung at events including a meeting with President Moon Jae-in. He has also been managing key domestic and global strategies. 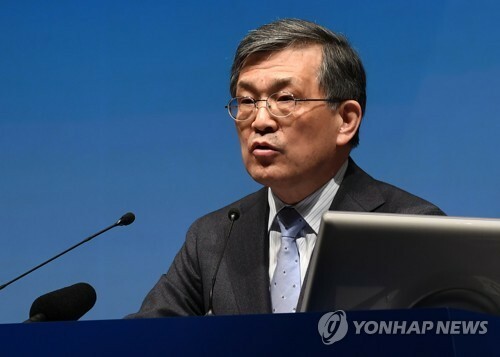 Apart from Lee, he has been the only person holding a vice chairman title at the group since former Vice Chairman Choi Jee-sung, who is also jailed over bribery, resigned earlier this year. According to Samsung, Kwon will soon notify Lee of his resignation. He will also notify the board of directors and recommend his successor. Kwon’s departure will deepen concerns over a leadership vacuum at Samsung, which already faces an uncertain future with the absence of two top leaders. The tech giant’s ailing Chairman Lee Kun-hee has been hospitalized for three years, while his son Lee Jae-yong, the company’s de facto leader, has been in jail for eight months over corruption charges. Samsung Electronics will likely carry out a personnel reshuffle next month to fill in Kwon’s absence. Kim Ki-nam, president of the semiconductor business of the device solutions division of Samsung Electronics, is the most likely candidate to replace Kwon, according to industry watchers. Kwon joined Samsung in 1985 as a researcher at the company’s semiconductor research institute in the US. He also served as head of its semiconductor business before becoming chief executive of the company in 2012. He has served as the chief of Samsung Display since 2016. He played a key role in bringing up Samsung’s crown jewel semiconductor business and raising Samsung’s NAND business to reach the world’s top in the market. With his engineering expertise, Kwon is also noted for leading the development of the world’s first 64-mega DRAM in 1992.